Alternate Cycle is your authorized Touratech dealer. 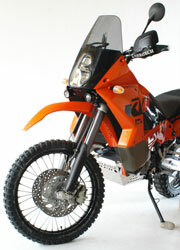 We can get you a variety of parts to make your KTM 950 Adventure even better. Contact us or drop by for more information. Here is a sample of what we can get for your Adventure. Click on the thumbnails for a bigger image. Touratech's new light cover with two headlights will give a new look to your Adventure. The front cover measures 44cm in height. That is 10 cm less than on the original. The front cover is also bent towards the top. The light cover is available in blue or black. The KTM 950/990 seat features a bucket shape platform (to make it more comfortable to sit on) and a non-slip, stylish cover. The The seat is available in three heights: "high", "low" and ï¿½standardï¿½. The "high" version is about 2 cm higher (0.8Inch) and the "lowï¿½ version is about 2 cm lower than the original seat. In order to increase the range of the KTM 950/990 Adventure significantly Touratech offers new large tanks with a total capacity of 45 litres. Just as with the original tanks here the two halves of the tank are fitted on the right and on the left. 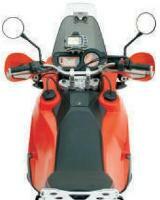 Even though these can carry significantly more, the width of the tank area of the KTM is only increased by about 6 cm each side. The tank is available in either orange, black or transparent white. Touratech's high fender kit makes the Adventure even more suitable for off-road riding. Low fenders are great for riding on wet pavement, but on wet dirt, mud can gather in the space, and can even stop the front wheel. The high fender does not detract from hispeed running even at maximum speed, and with the pattern of CNC holes,cooling is not blocked for low speeds. 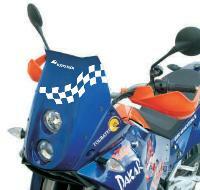 The mudguard is available in either orange, silver, or black. Anyone who has pulled a loaded KTM from the long forks onto the center stand will appreciate our Lift Handle! Discreet, but placed at just the right position, Touratech's Lift Handle is a great aid when pulling your bike up onto the stand. The Lift Handle also makes lifting the machine easier if you happen to dump it in the sand. Black coating, for the left side only.